The Dell EMC PowerEdge R7415 is an insanely good server. In fact, it may be the best single socket server on the planet. 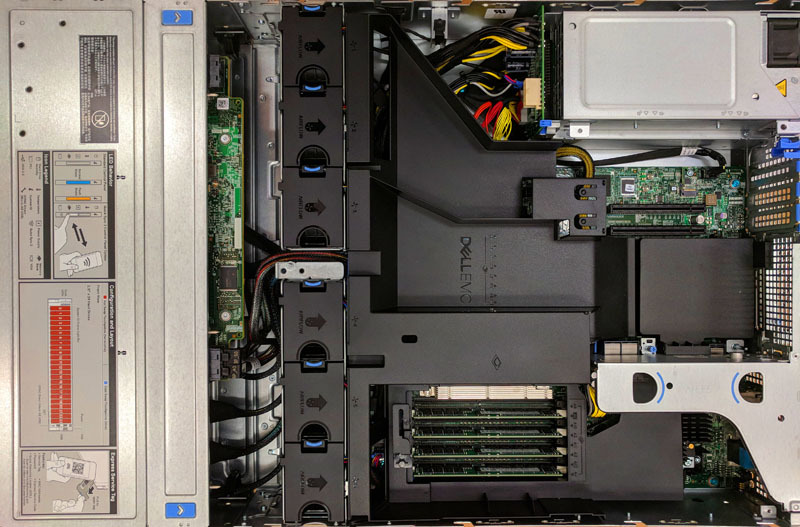 The server features a single socket AMD EPYC platform with an enormous capacity for high-speed networking, NVMe storage, memory capacity, cores counts, and just about every other aspect that makes a server good. 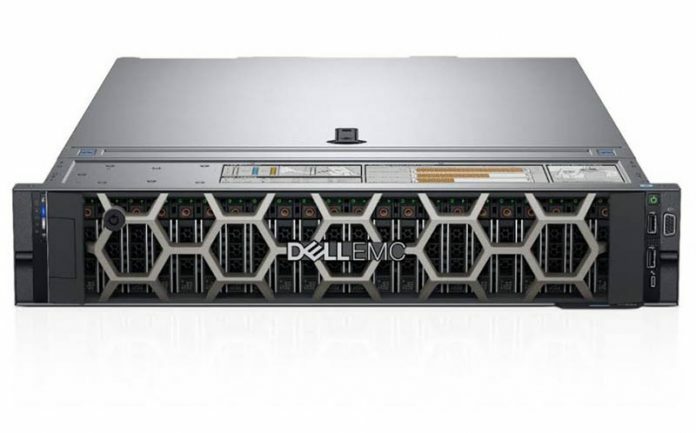 In our Dell EMC PowerEdge R7415 review we are going to go in-depth to show you why this is a disruptive server regarding price, performance, and capabilities. We are also going to show you why Dell EMC is a class-leading solution for AMD EPYC. 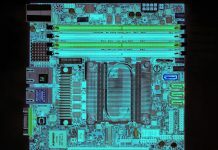 Finally, we hope to answer many of the questions a potential buyer may have when deciding AMD EPYC v. Intel Xeon. First, we are going to start with our test configuration, and we will discuss why the server with AMD EPYC is an enormous value. As you can see, we tested the server with every single socket AMD EPYC 7001 CPU option. The server itself has significantly more expansion options than we would normally see on the Intel Xeon side. 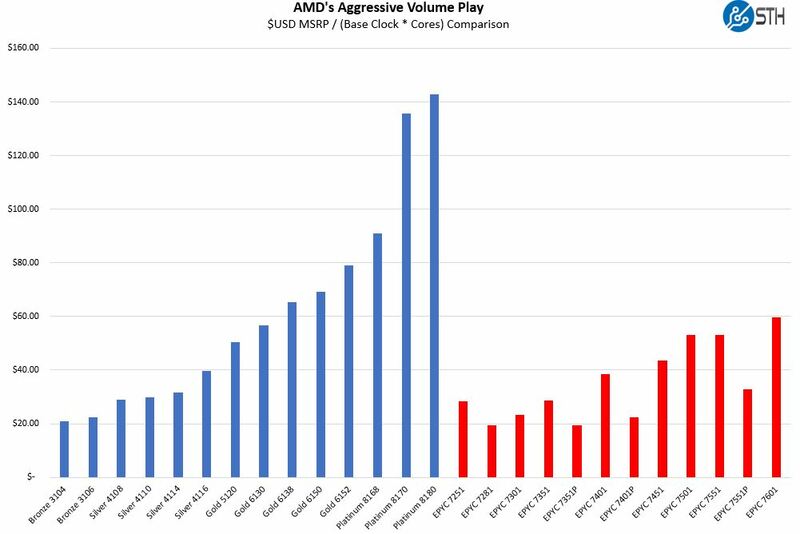 We have a piece on the single socket offerings called AMD EPYC’s Extraordinarily Aggressive Single Socket Mainstream Pricing. Here is one chart which shows how the entire AMD EPYC line, especially the P series parts, are aggressively priced against Intel Xeon offerings of this generation. One can see that AMD is pricing the P series parts effectively in-line with the pricing structure of the lower-end of Intel Xeon. If you look at our AMD EPYC 7551P benchmark piece, you will see that even given this pricing, AMD EPYC will also be faster than Intel Xeon. Beyond the raw chip, MSRPs are software license costs. If you are running SQL server with a per-core licensing, Intel Xeon Scalable still makes more sense. Intel has specific SKUs designed for these licensing models. If you are instead running a VMware virtualization host with per-socket licensing, then the Dell EMC PowerEdge R7415 allows one to use fewer sockets and therefore enjoy a much lower TCO. 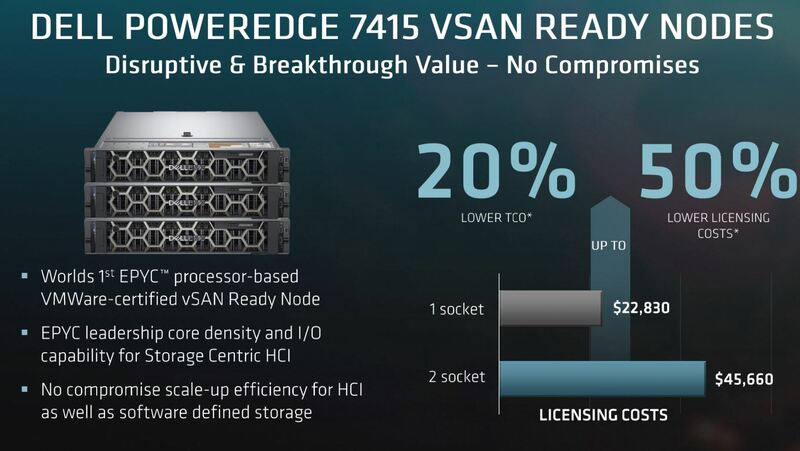 Dell EMC and AMD advertise that Dell EMC PowerEdge R7415 vSAN Ready Nodes offer 20% lower TCO. As some perspective here, the licensing cost savings come from Dell Technologies VMware arm. If Dell EMC is advertising a 50% license cost savings from another part of Dell Technologies, you know it sees this solution as a significant disruptor in the ecosystem. 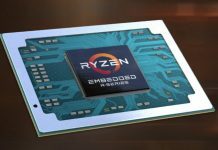 The AMD EPYC platform and categorically the P series parts are enablers of this cost savings. Next, we are going to get into the details of the Dell EMC PowerEdge R7415 hardware, architecture, software, performance, power consumption and then give our final thoughts on the platform. Buckle in for the most in-depth PowerEdge R7415 review on the planet. The Dell EMC PowerEdge R7415 sports an enormous capacity for high-speed networking, NVMe storage, memory capacity, cores counts, and just about every other aspect that makes a server good. It has features that many competitors cannot match today including NVMe hot swap including NVMe hot plug capabilities. Does the unit support SAS3/NVMe is any drive slot/bay, or is the chassis preconfigured? You can configure for all SAS/ SATA, all NVMe, or a mix. Check the configurator for the up to date options. It depends on how you have the chassis configured. It sounds like they have the 24 drive with max 8 NVMe disk configuration. With that the NVMe drives need to be in the last 8 slots. How come nobody else mentioned that hot swap feature in their reviews. Great review as always STH. 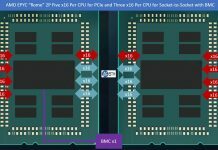 This will help convince others at work that we can start trying EPYC. These reviews are gems on the Internet. They’re so comprehensive. Better than many of the paid reports we buy. I take it the single 8GB DIMM and epyc 7251 config that’s on sale for $2.1k right now isn’t what you’d get. Great review! Any chance of a cooling analysis (with thermal imaging)? Koen – we do thermal imaging on some motherboard reviews. On the systems side, we have largely stopped thermal imaging since getting inside the system while it is racked in a data center is difficult. Also, removing the top to do imaging impacts airflow through the chassis which changes cooling. The PowerEdge team generally has a good handle on how to cool servers and we did not see anything in our testing, including 100GbE NIC cooling, to suggest thermals were anything other than acceptable. Thanks for the reply Patrick. Understand the practical difficulties and appreciate you sharing your thoughts on the cooling. Fill it up with hot swap nvme 2.5″ + add-in cards and you got a serious amount of heat being generated! Great Review! Many thanks, Patrick!